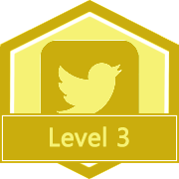 ​A great way to boost your on-line presence and to connect with other educators is to host an education themed Twitter chat. 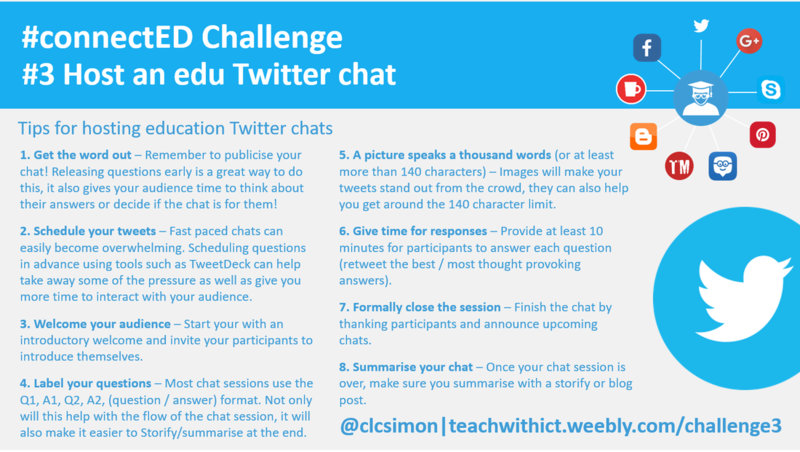 Most Twitter chats are always looking for people to 'guest host' or moderate - great examples include: #UKEdChat #BettChat and #DojoChatEu. Get the word out – Once you’ve organised your chat and settled on the questions, the next step is to publicise it. There are several ways you can promote your chat session; blogging about your chat session prior to the event, releasing the questions early through tweets, promoting via Facebook are all ways you can publicise your chat session. Another great way to promote your chat session is to invite key followers to co-host or take part in your chat. Note: Make sure to include designated hashtag when inviting followers / publicising your chat session. Schedule your tweets – During popular/fast paced chats it can be easy to get overwhelmed and forget to post the next question or not have time to respond to tweets because you’re too busy posting questions. Scheduling questions in advance using tools such as TweetDeck can help take off some of the pressure as well as give you more time to interact and respond to participants. Welcome your audience – Start your with an introductory welcome and invite your participants to introduce themselves. You could start with an ice breaker question such as “What is your name and where are you from” etc. Label your questions – Most chat sessions use the Q1, A1, Q2, A2, (question / answer) format. Not only will this help with the flow of the chat session, it will also make it easier to storify/summarise later (See ‘After the chat’). A picture speaks a thousand words (or at least more than 140 characters) – Images will make your tweets stand out from the crowd, they can also help you get around the 140 character limit. Give time for responses – Provide at least 10 minutes for participants to answer each question (retweet the best / most thought provoking answers). For a 1 hour chat session, I recommend 5 or 6 questions (one released every 10 minutes or so). Formally close the session – Finish the chat by thanking participants and announcing upcoming chats (including chat day/time and topic). Storify your chat – Once your chat session is over, it is not necessarily the end. A great way to encourage a new audience to take part in future chats is to storify your chat session and share with all those who took part in the chat.